While reflecting on important dates in the history of anaesthesia, Dr Christine Ball, Honorary Curator and Monica Cronin, Curator of the Geoffrey Kaye Museum of Anaesthetic History looked at the early days of anaesthesia practice and their impact on contemporary practice. October 16, 1846 is an important day in the history of the world. It marks the first successful public demonstration of inhalational anaesthesia. If you’re not convinced about the importance of this, perhaps you should read Fanny Burney’s account of a mastectomy without anaesthesia. The anaesthetic, ether, was administered by a dentist, William Morton, at the Massachusetts General Hospital in Boston. The idea of painless surgery wasn’t new but previous attempts over the centuries had been with oral sedatives; these often rendered people unconscious for days and had significant complications. Simple, quick, reversible anaesthesia had largely been considered impossible. There were even physicians who considered the level of pain experienced during an operation an important part of the healing process. Others had previously tried to demonstrate painless surgery. Horace Wells, a dentist from Hartford Connecticut, had noted the pain-killing properties of nitrous oxide during a “laughing gas” roadshow. He incorporated nitrous oxide into his dental practice, performing painless procedures. However, when he was granted permission to demonstrate it to medical students and physicians in January 1845, things did not go smoothly. The patient cried out during the procedure, the audience perceived him to be in pain and jeered at the dentist. Wells was professionally disgraced. He gave up dentistry and became a travelling salesman, eventually relocating to Paris in 1847. Upon his return to the US he began using chloroform recreationally and became increasingly deranged. In one incident he threw sulfuric acid over two prostitutes. He was imprisoned for a time, which appeared to clear his mind a little as he was without chloroform, only for him to commit suicide when given unsupervised access to his shaving kit. The path to painless surgery was not an easy one. American physician Crawford Long lays claim to being the first to administer ether as an anaesthetic agent for an operation in 1842. As with Wells, Long had noted its pain-killing properties during the recreational “ether frolics” of the Victorian era. People inhaled ether vapour and didn’t feel the pain of the bumps and bruises they experienced as they stumbled about. Inexplicably, Long delayed publishing his findings until well after Morton’s demonstration at what is now known as the “Ether Dome”. Word of Morton’s success travelled very quickly. By December, physicians were experimenting with inhalational ether in London. Like their American counterparts, they too found that inhalational ether produced painless surgery. They wrote up their findings in the newspapers of the time, which were quickly packed aboard ships bound for the antipodes. 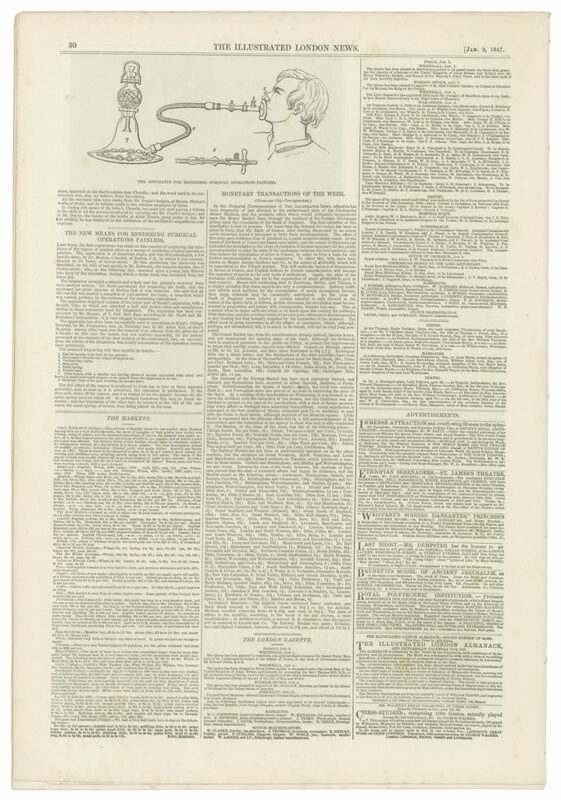 A January edition of the Illustrated London News reached Australian shores in May 1847, containing a short article about the successful use of inhaled ether as a means of rendering surgery painless. In response to the article a Sydney dentist, John Belisario, performed two procedures using the new technique. A small crowd was in attendance, including a journalist. William Pugh, a Launceston physician, used the article to design and create his own inhaler and on 7 June, performed three surgical procedures, also with a journalist in attendance. Across the Tasman in Aotearoa New Zealand, things took a little longer to take off. But, in September 1847 optician, Mr James Marriott, was working on a device for inhalational ether. On the morning of Monday, 27 September, an unnamed prisoner from Wellington Gaol was taken for a dental extraction, performed by the Colonial Surgeon, Dr J. P. Fitzgerald. Mr Marriott administered sulphuric ether using his device and the tooth was extracted painlessly. The morning’s activities may well have been a dress rehearsal for the main event. A Māori chief, Hiangarere, had a large tumour on his shoulder and Fitzgerald had scheduled surgery to remove it for the afternoon of the 27th. Not only was Hiangarere an important Māori chief, he was one of the signatories on the Treaty of Waitangi. He was accompanied by an entourage; New Zealand’s second anaesthesia was in front of an audience who, if things had gone badly, may have been more hostile than those witnessing poor Horace Wells’ disgrace. However, much like the earlier dental extraction, the procedure was successful. Fitzgerald removed a 3lb tumour from Hiangarere’s shoulder and the chief claimed the sensations produced by ether were pleasurable. Each year on 16 October, ANZCA commemorates the first successful public demonstration of ether anaesthesia with National Anaesthesia Day (#NAD). Each year the theme changes and this year its focus is on regional anaesthesia. ANZCA poses the question “Is regional anaesthesia for you?” Now, what does this mean? Let’s go back to 1884. Sigmund Freud had been experimenting with the effects of cocaine use and wrote a seminal paper, Über Coca, in 1884. One of his findings was that “[o]ne feels a certain furriness on the lips and palate“, an anaesthetising effect. Karl Koller, an ophthalmologist from Vienna, recognised the value of this effect and realised its potential as a local anaesthetic. Under ether anaesthesia, the eye continued to move about, which is unsurprisingly awkward for eye surgery. Koller’s experiments with cocaine drops in the eye were successful. Patient’s felt no pain and, as an additional benefit, the eye didn’t move about. It took a while for wider use though. Once cocaine was proven to have local anaesthetic properties in the eye, it was quickly utilised for other forms of local anaesthesia. Soon surgeons were injecting cocaine around nerves and into the cerebrospinal fluid. These injections allowed them to anaesthetise a region of the body – an arm for example, by injecting around the nerves in the armpit, or the lower half of the body with a spinal anaesthetic. There were many advantages to this, especially when the patient was very unwell and thought to be too sick for general anaesthesia. Surgeons also liked the fact that they could perform the regional anaesthesia and then continue with the surgery without requiring an anaesthetist. It soon became apparent that there were problems with this approach. Cocaine was not an ideal drug; it was addictive and short acting, and required supplies of coca leaf from South America. Surgeons, not surprisingly, found that they did need someone to care for the patient while they operated, even if the operative area was numb. Synthetic local anaesthetics soon became available without the addictive properties of cocaine. Designer drugs were created – short, fast onset drugs for quick procedures, such as suturing a simple wound, or slow onset, longer lasting drugs for postoperative pain relief. Today we have a wide range of local anaesthetics and can anaesthetise many regions of the body; modern ultrasound machines facilitate more accurate placement of local anaesthesia by allowing visualisation of nerves. Specialist anaesthetists are highly skilled in regional anaesthesia and are the only people who can explain whether regional anaesthesia is right for the patient and the particular surgery being performed. They can outline all the risks and benefits to patients, allowing them to make an informed decision and have the best possible journey through surgery and anaesthesia. Regional anaesthesia is now a highly technical area of anaesthesia, requiring just as much training and attention as general anaesthesia. Importantly, even if regional anaesthesia is performed, the anaesthetist will still remain with the patient throughout the entire operation, responding to all the important physiological changes which may occur during an operation and all the patient’s needs. Some forms of regional anaesthesia can also be continued for postoperative pain relief with infusions into areas like the epidural space. These techniques can be extremely helpful in painful, extensive surgery, such as lung transplants, allowing patients to mobilise quickly after the operation, facilitating a complication-free recovery. Image 1: copy of the London Illustrated News, January 1847, from the Geoffrey Kaye Museum of Anaesthetic History. 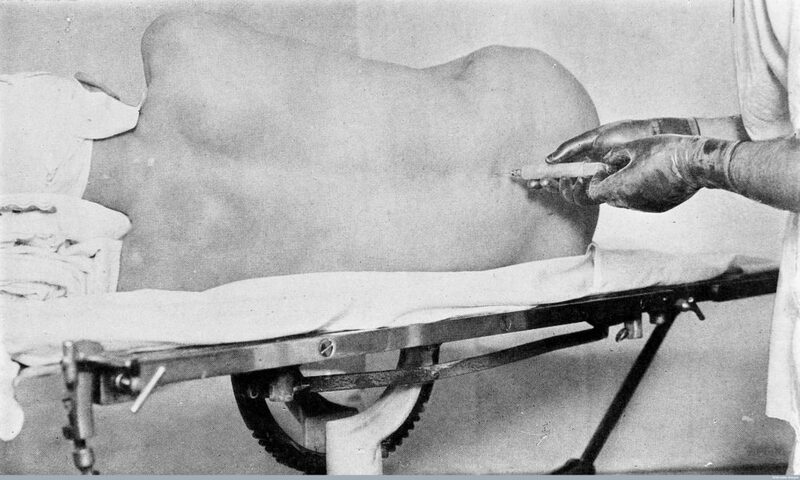 Image 2: spinal anaesthesia from the Wellcome Library, London.